Cal here again to pick up on the discussion of drinking related vessels. 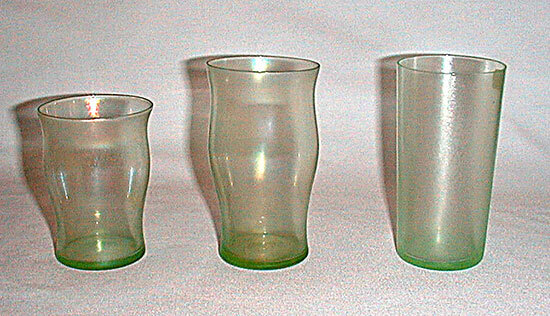 Tonight let’s focus on Fenton tumblers, of which there are quite a few styles. 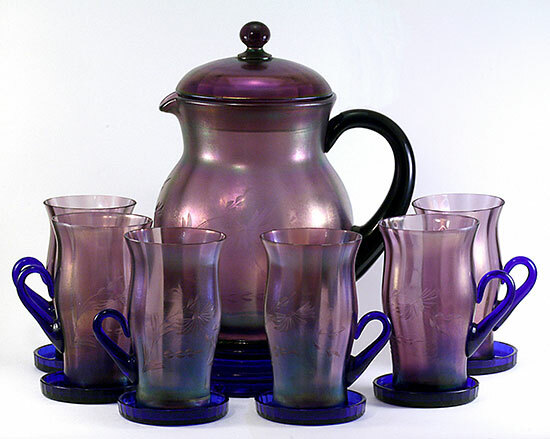 Sometimes it is easy to see how a particular tumbler “goes with” a particular pitcher because the shapes match quite nicely. 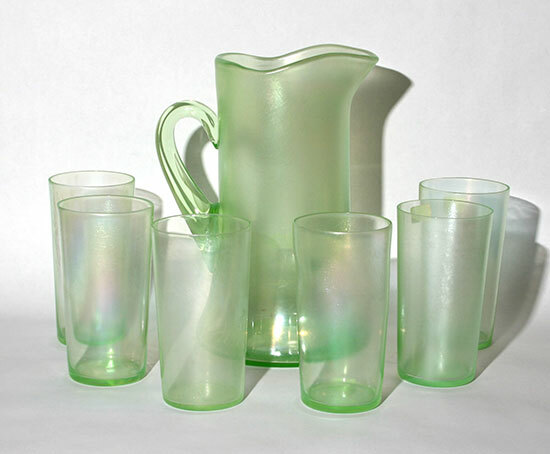 But there are other situations where there are a couple of tumblers which are seen with various pitchers and I’m not sure anyone can say for sure if one goes with the other or not. Fenton made a very basic tumbler, which I refer to as the “barrel” tumbler. Here it is with the pitcher with which it goes. These are known in Celeste Blue and Marigold with wheel etching. This set in any other color would be unusual. The next two styles seem to have been used somewhat interchangeably with the #220 rib optic pitcher (the squatty one with a cover). 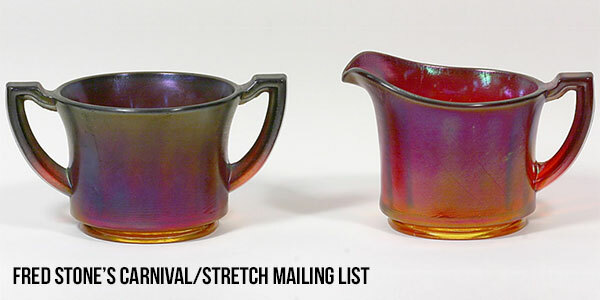 They both look ok with that pitcher, so pick the style you like the best and put a set together. The hourglass-shaped tumbler is #220 and the ones with the flared top are #222. The #222 flared tumbler doesn’t go particularly well with the taller #222 pitcher, so I’m not sure why it got the #222 designation. The #220 flared tumbler is clearly the less common of the two and comes in fewer colors than the #222 hour glass shaped ones. Interestingly, the hourglass shaped tumblers are found with and without handles. If they are handled, the handles are usually cobalt blue, whereas we find the flared #222 tumblers with crystal handles. The handles are never iridized. Fenton made a grape juice set which is smaller than the regular lemonade or iced tea sets. 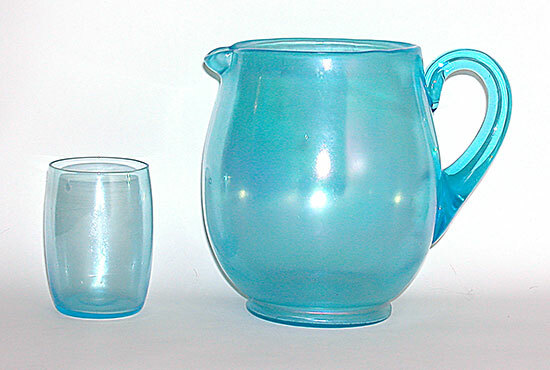 The pitcher is a tankard-type (8 1/4″ tall) and the tumbler (3 5/8” tall) also has rather straight sides. We are aware of these in Celeste Blue, Florentine Green and Persian Pearl. 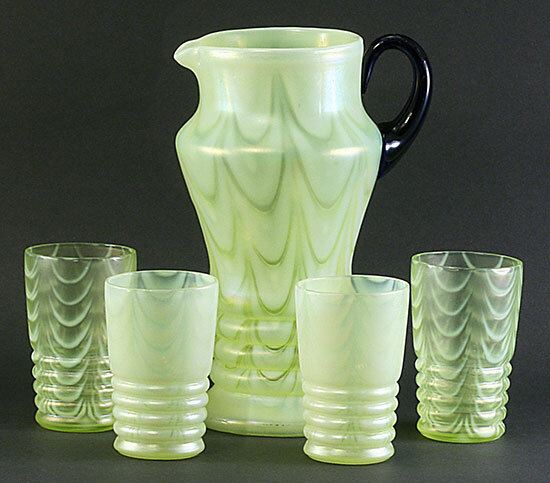 The Florentine Green sets are found more often than the others. 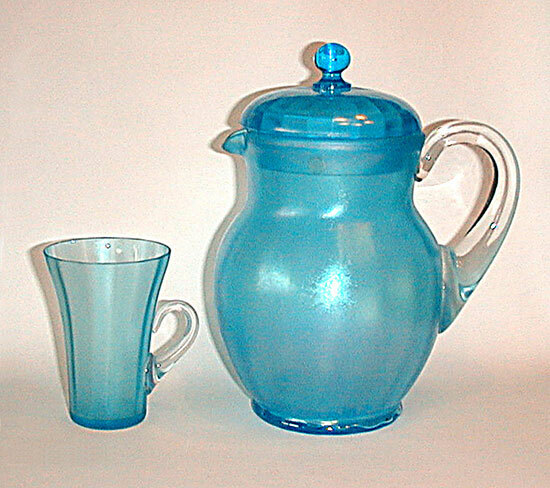 I’ve seen more Persian Pearl pitchers than tumblers and have the Celeste Blue tumblers but not the pitcher. 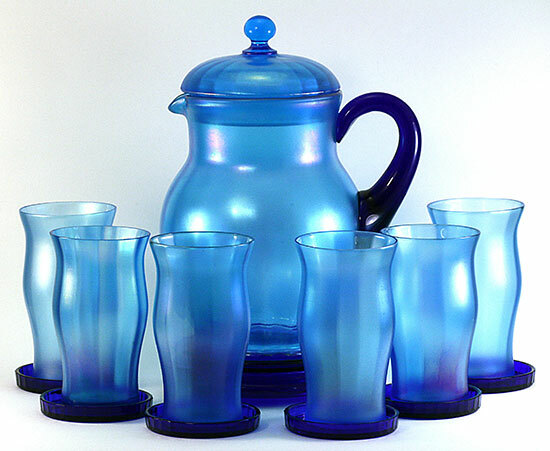 Anyone have a Celeste Blue Grape Juice Pitcher? 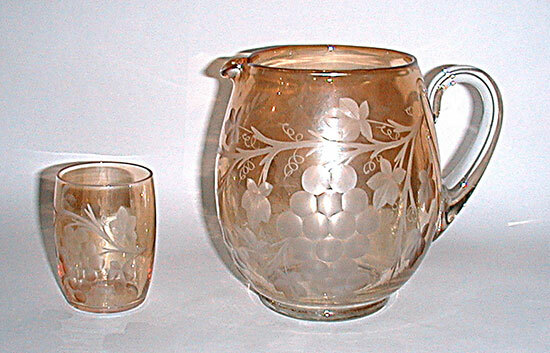 There is a second tankard pitcher made by Fenton. This one is larger (9 1/4″ tall) and is often associated with an hourglass shaped tumbler without a handle. 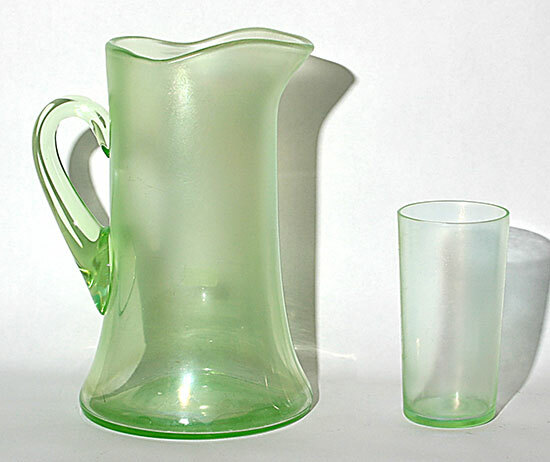 There is a larger version of the juice tumbler which also goes nicely with this pitcher. Finally there are some ringed tumblers to go with the ringed pitchers. As I mentioned last time, there are 3 sizes of ringed pitchers and there are at least 2 sizes of ringed tumblers to go with them. The smallest ringed tumblers are considered juice glasses. They typically have straight sides and are a bit wider at the top than at the bottom. The second size is about 2” taller (5 3/8”) and follows the contour of the pitcher more closely with a bulge about 2/3rds of the way up the tumbler and a slightly flared top. Some of the #220 and #222 tumblers are wheel etched. It is a challenge putting matching sets of tumblers together with pitchers which have the same cutting. The sets typically have a pitcher and 6 tumblers. Getting all 6 tumblers can be quite challenging. Just a quick note about colors. 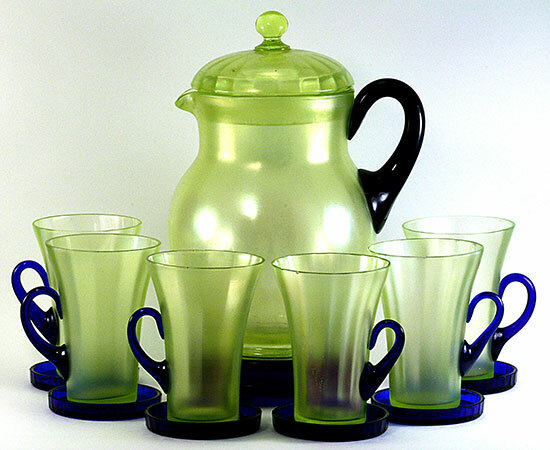 Celeste Blue, Topaz and Florentine Green are fairly common, but we don’t see Florentine green tumblers with handles. We do see Wisteria handled tumblers but they are not common. We find #220 hourglass tumblers without handles in Velva Rose, but not with handles. If they were to be found with handles, I would expect them to be Velva Rose handles, since we don’t see any other Velva Rose with cobalt or crystal handles. By my count, you would need more than 20 ‘beverage’ sets to have 1 each of all the known combinations of shapes, handles and pitchers. That would be quite an accomplishment! That wraps up pitchers and tumblers by Fenton. We will move on to another company next time. We would love to see photos of any of your beverage sets; please send them in to Brian and he will include them in the future.